The NFL's Washington Redskins dismissed various hoax news stories on Wednesday that claimed the NFL team decided to change its name to the "Washington Redhawks." There have been at least three false news stories from sources posing as Sports Illustrated, the Washington Post, and ESPN, which were circulated Wednesday morning alleging the team had finally folded to calls for a name change, Politico reported. However, it was discovered the webpages were fake and only designed to to look like different news sites. 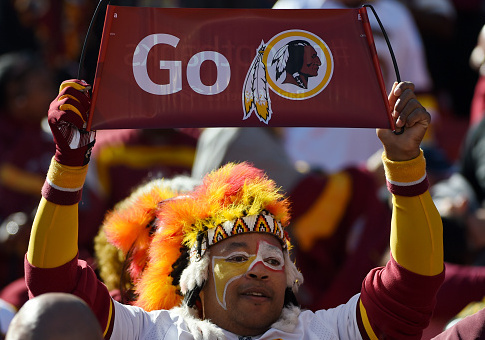 The stories reported the Redskins caved on changing its name, which some claim is derogatory to Native American people. A Redskins spokesperson set the record straight. "This morning, the Redskins organization was made aware of fraudulent websites about our team name," a Redskins spokesperson said in a statement. "The name of the team is the Washington Redskins and will remain that for the future." The article published on the page mimicking Sports Illustrated was headlined with, "Washington football Ditches Controversial Name for Redhawks." The fake ESPN article reported that Dan Snyder, the Redskins’ owner, decided to "honor" Native Americans by updating the name. Snyder has maintained a position of being staunchly opposed to changing the name. In another webpage made to look like the Washington Post sports section, the headline read, "Native Leaders Celebrate Victory as Washington Football Changes Mascot to the Redhawks." The web page included suggested hyperlinks to one of the other impersonators, indicating a potentially coordinated hoax. The culprit also set up a website designed to look like a redesign of the Redskins’ team website that included photoshopped images of their new mascot. "The hawk was chosen to represent the strength, speed, and courage of the Washington Redhawks’ players," a faux announcement on the hoax website read. The real Sports Illustrated set the record straight with a Wednesday tweet that included a picture of the article that attempted to imitate a Sports Illustrated webpage. "FYI, don’t be fooled. This is not Sports Illustrated," the sports media outlet tweeted. ESPN did not immediately respond to Politico’s request for comment, but the Post did report on the fake sites in an article of their own. In July, the Supreme Court ruled in favor of Snyder and the Redskins’ trademark to uphold the team's ability to utilize the name despite those who oppose it. This entry was posted in Issues and tagged ESPN, Football, Native American, Sports, Washington Post, Washington Redskins. Bookmark the permalink.